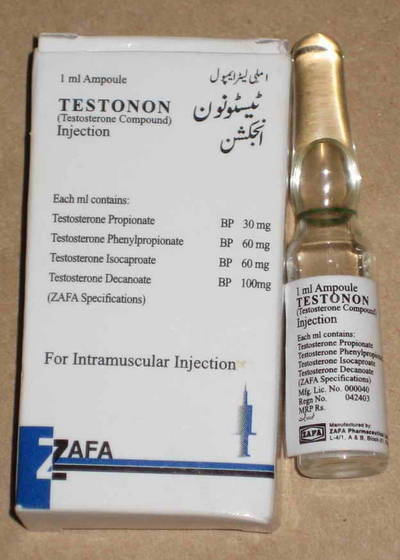 Testonon is a very popular steroid which is highly appreciated by its users since it offers several advantages when compared to other testosterone compounds. Sustanon is a mixture of four different testosterones which, based on the well-timed composition, have a synergetic effect. This special feature has two positive characteristics for the athlete. First, based on the special combination effect of the compounds, Sustanon, milligram for milligram, has a better effect than Testosterone enanthate, cypionate, and propionate alone. Second, the effect of the four testosterones is time-released so that Sustanon goes rapidly into the system and remains effective in the body for several weeks. Due to the propionate also included in the steroid, Sustanon is effective after one day and, based on the mixed in decanoates, remains active for 3-4 weeks. Sustanon has a distinct androgenic effect which is coupled with a strong anabolic effect. Therefore it is well suited to build up strength and mass. A rapid increase in body strength and an even increase in body weight occur. Athletes who use Sustanon report a solid muscle growth since it results in less water retention and also aromatizes less than either testosterone enanthate or cypionate. Indeed many bodybuilders who use testosterone and fight against distinct water retention and an elevated estrogen level prefer Sustanon over other long-acting depot testosterones. It is further noticed that Sustanon is also effective when relatively low doses are given to well advanced athletes. It is interesting to note that when Sustanon is given to athletes who have already used this compound in the same or lower doses, it leads to similar good results as during the previous intake. Sustanon is usually injected at least once a week, which can be stretched up to 10 days. The dosage in bodybuilding and powerlifting ranges from 250 mg every 14 days up to 1000 mg or more per day. Since such high dosages are not recommended-and fortunately are also not taken in most cases the rule is 250-1000 mg/week. A dosage of 500 mg/week is completely sufficient for most, and can often be reduced to 250-mg/ week by combining Sustanon with an oral steroid. Sustanon is well tolerated as a basic steroid during treatment which stimulates the regeneration, gives the athlete a sufficient "kick" for intense training units, and next to the already mentioned advantage of rapid strength increase and solid muscle gain distinguishes itself also by its compatibility. In order to gain mass fast Sustanon is often combined with Deca-Durabolin, Dianabol or Anadrol while athletes who are more into quality prefer combining it with Parabolan, Winstrol, Oxandrolone or Primobolan. Click the button below to add the Testonon 250 mg by zafa 1 ml / Amp to your wish list.